The infamous actions of Stella Goldschlag – a “catcher” of Jews during the Second World War (despite being Jewish herself) in order to guarantee her safety and that of her parents – were undoubtedly heinous and evil. 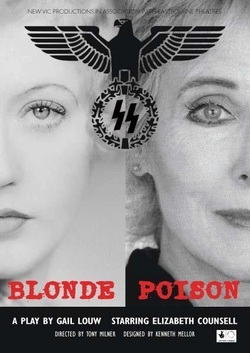 Yet Gail Louw’s new play Blonde Poison – the nickname given to Goldschlag thanks to her typically Aryan looks – poses the question, what would you do in that situation? The play draws heavily on the book Stella, written by Goldschlag’s childhood friend Peter Wyden, who nurtured a schoolyard crush for her before escaping Nazi Germany in 1937. The book explores what drove the young woman to become an informant, and Louw took Wyden and Goldschlag’s reunion interview as the basis for her work. Louw is no stranger to the time period, or writing about her faith – her play Two Sisters, part of Devonshire Park’s Studio Season last year, was based on her mother and aunt meeting up and talking about how the events of the war shaped their family. “Many of my plays are about Jews. I am Jewish, but I’m not a terribly good one. Clearly, though, all these things are buried within – my mother’s parents were killed in a concentration camp,” says Louw. It is extraordinary that Goldschlag’s journey to becoming a monster – estimates place that somewhere in the region of between 600 and 3,000 Jewish men and women were captured and sent to camps following her entrapment – came from being betrayed herself. At the start of the war she was handed over to the Gestapo by an acquaintance, a fellow Jew, and was arrested and beaten for carrying forged ID. Several sources, including the Holocaust Chronicle, have come to suggest that Goldschlag hated her Jewishness. It’s a statement Louw agrees with. “The German Jews were very disdainful of the Eastern ones, and thought they were disgusting, poor and dirty – these people who looked so Jewish and spoke this foreign language didn’t fit in and didn’t appreciate Brahms and Beethoven,” she explains. Victim or monster? It seems nothing in Stella’s story, Louw argues, is black and white. READ THE FOLLOW UP INTERVIEW TWO YEARS LATER . . .
More than two years on from her Argus Angel-winning play’s debut, Gail Louw’s feeling about her central character Stella Goldschlag hasn’t changed. Blonde Poison is based on the true story of the Nazi collaborator Goldschlag, who informed on her fellow Jews in return for her family’s safety and her own comfort within the vicious regime. The play, which stars Elizabeth Counsell as the titular Blonde Poison, sees Goldschlag preparing herself for an interview decades later with journalist and one-time childhood sweetheart Peter Wyden by trying to justify what she did. Brighton-based Louw is keen to emphasise that Blonde Poison isn’t “just another Holocaust play”. Gail Louw is now a full-time playwright and adoring grandmother. Having spent much of her previous life as an academic she now has the luxury of concentrating on writing exhaustively researched plays. Gail is Jewish, but thinks "she may not a terribly good one"! However, her life has been shaped by the death of both her mother's parents in a concentration camp and the rich culture of her upbringing. This has inspired many of Gail's professional productions including Killing Faith, Two Sisters and more recently Joe ho ho. Blonde Poison is her latest play, gaining admiring audiences and recognition from respected critics. It has been funded by the Arts Council, and is embarking on a regional tour beginning in London in 2012.